How white your white shoes are? Probably not as dazzling white as you’d like them to be even if you wore them outside just once. White shoes always look so trendy and cool! You just can’t help but buy them even despite the fact that keeping them clean and great-looking will be such a pain. 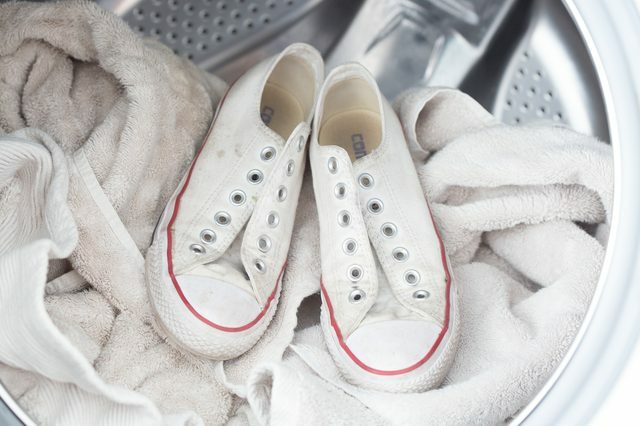 However, if you’re a true white or light-colored shoe lover, the cleaning hustle won’t stop you from wearing your snow white converse, trainers or other shoes. 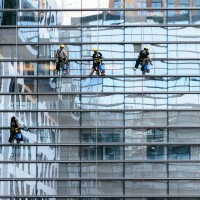 It will only make you find effective ways and tricks in order to keep them sparkling clean and as white as new. I’m going to hook you up with a couple of ways to clean white sneakers and other light canvas shoes, as well as remove different stains from them. 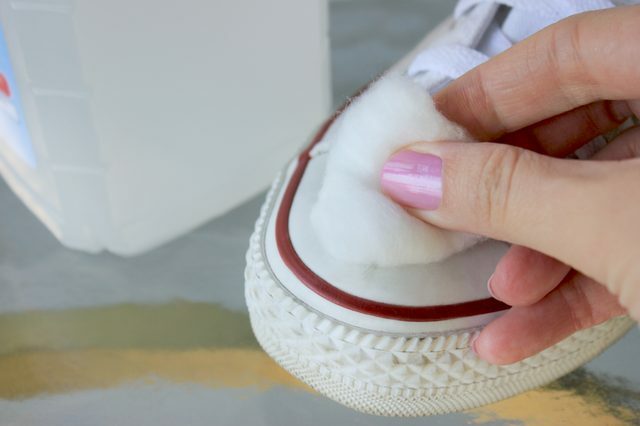 Treat your white canvas shoes with either carpet cleaning spray, or your ordinary clothes stain remover, let it work for 15 minutes or so, find a washing machine bag, throw them in there and wash them in your washing machine. Set it on a short sensitive cycle with mildly hot or cold water regime. You’ll get your shoes cleaned thoroughly with a nice fresh smell as a bonus. Be careful not to choose too hot water regime, so that your shoes don’t shrink and become too small for you. Don’t forget to wash laces as well. If you’d like to dry your shoes, place them in a dryer along with a couple of big towels. They’ll prevent them from banging onto the dryer, as well as losing their shape. Use this trick while machine washing your shoes as well. 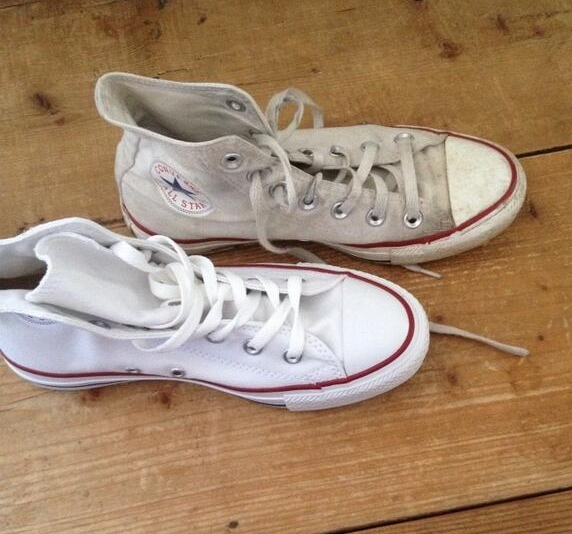 Too dirty and well-worn white shoes require special cleaning treatment. You’ll need to work hard to bring them back to life. In order to get rid of major dirt stains, you’ll need 409 cleaner or any other all-purpose spray cleaner, an old toothbrush and a couple of paper towels. 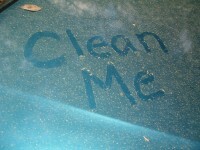 Spray the stains with cleaner, wet the toothbrush and rub the sprayed areas with it. Wipe your shoes every once in a while to get rid of the dirt that’s already come off. Don’t rub too hard not to damage the surface of your shoes. Continue rubbing until your shoes turn completely clean. You may use your whitening toothpaste or highly concentrated dish soap as an alternative to 409 cleaner, especially if you don’t have it in your house. 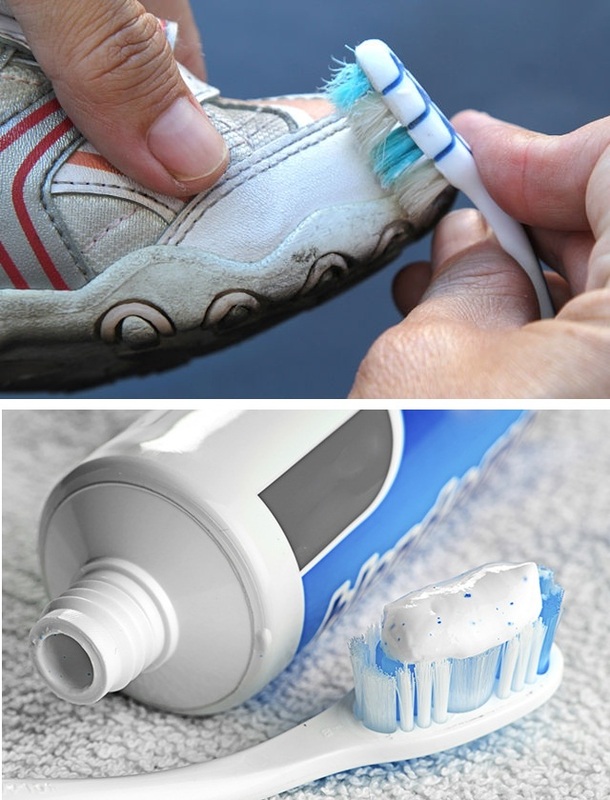 If you use toothpaste, rub it into the shoe using an old toothbrush and let it sit for 10-15 minutes before proceeding to ‘active white shoes cleaning’. Your ordinary makeup remover (micellar water, for instance) and a cotton disc will help you clean the white shoe sole and rubber/leather toe bit of your shoes. 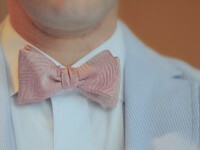 It will rejuvenate the white color, as well as remove even quite old stains. Magic erasers and vinegar are great and removing stains on white shoes as well. Bleach is probably the most effective white shoe cleaner that will deal with the heaviest stains and dirt spots. However, you have to be really careful while using it. You need to make sure that the material your shoes are made of won’t be damaged by bleach. Also, you won’t be able to use it if your white shoes have any pattern on them. And, you should be extremely careful while applying it to remove stains from white sections of multi-colored shoes. So, in order to bring the white color of your canvas shoes back, protect your working area not to discolor it, put the rubber gloves on, mix one part of bleach and 5 parts of water. Apply it on your shoes with a trusty toothbrush to get rid of various stains and dark spots. Unpleasant and quite embarrassing shoe odor may be eliminated by baking soda. You may also put your shoes in a zip-lock bag and place them in the freezer for several hours. The low temperature will kill the bacteria that make your shoes smell. Your shoes might be cleaned in the dry cleaners. Those who’re used to dropping their clothes off at the dry cleaning shops will definitely appreciate professional canvas shoe cleanup. Even the most hopeless dirt, grass and blood stains will come off. 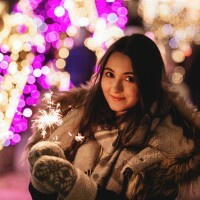 If any of the methods above doesn’t work as great as you’d like them to, don’t hurry to throw your favorite pair of keds or trainers to the back of your closet. 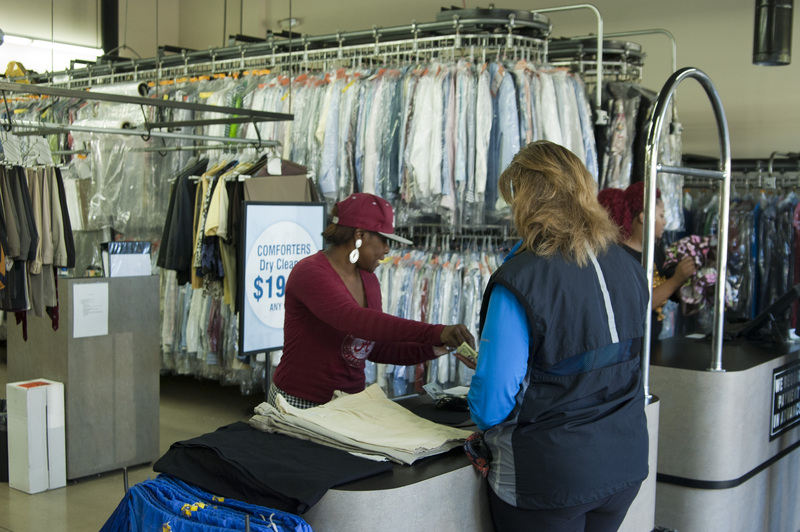 Just go to HireRush.com and post a shoe dry cleaning task to see if any of the local pros will be able to help you go through this challenge.